This entry was posted in Canada Canada Immigration and tagged Canada Express Entry Visa on April 25, 2015 by Blog Author. 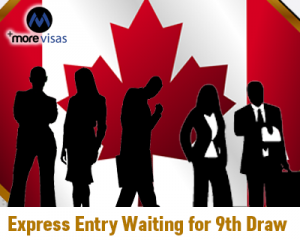 On 17 April 2015, the long-been wait has ended shortly, with the announcement of an Express Entry eight draw results. Soon after the completion of seventh draw on 10 April 2015, the Citizenship and Immigration Canada have conducted another draw within a week and issued 715 invitations and this time the cut-off score is 453. Canada has always topped the chart when it comes to offer amazing job opportunities. Thus, numerous individuals show interest to migrate to Canada. With the launch of Canada Express Entry system on 1 January 2015, the count of immigrants migrating to Canada has further increased. Following the launch of Express Entry system, so far, eight draws where conducted by the CIC and the candidates are eagerly awaiting Express Entry ninth draw which is predicted to happen in the month of May. The recent Express Entry eighth draw was conducted between 17 April 2015 and 18 April 2015. It is the fourth in succession in which the federal government has selected a portion of candidates who do not have a valid job offer from an employer in Canada or provincial nomination. The initial four draws were made between 31 January and 27 February 2015 and picked only candidates who hold either a qualifying job offer or provincial nomination. The CRS (Comprehensive Ranking Score) points in the recent draw matches the least CRS point’s requirement of any draw and in the sixth Express Entry draw also the lowest CRS score was 453. In the Express Entry 8th draw, the count of ITAs issued to the Express Entry pool candidates has decreased when compared to the previous draw. On whole, so far 7,566 invitations were granted to the candidates in eight draws. And, this is one of the shortest gaps between two consecutive draws. Candidates who are still waiting for ITAs must keep fingers crossed and await Express Entry ninth draw. If you want to apply Express Entry, fill out our Enquiry form, so our visa expert will get back to you. Hi .I am murali krishnan .I have ranked to a total of 295 points .Can you advise me as to whether will i get an invitation to apply for this year's Express entry .If not can you suggest me an alternative to increase my points where i can get a sure possibility of getting an ITA by this year ..